What does your ultimate dream job look like when you imagine it? For me, the ultimate dream job would be something where I can make my own schedule, wear whatever I want (including my pajamas), only do work I enjoy, and get paid well. But does such a thing exist? Public opinion seems to say no. People think that if you can set your own schedule or work at home in your pajamas, you can’t make any money. That is simply not true. Today I want to tell you about a few side hustles that accomplish at least one of the criteria for my ultimate dream job. While a side hustle means it’s something you do in addition to your day job, some people are able to take that side hustle to the next level eventually and make it their primary source of income. Then they are basically livin’ the dream at their ultimate dream job every day. These are real side hustles as well, not the usual suggestion to fill out 1,000 surveys at a penny a pop on Opinion Outpost. 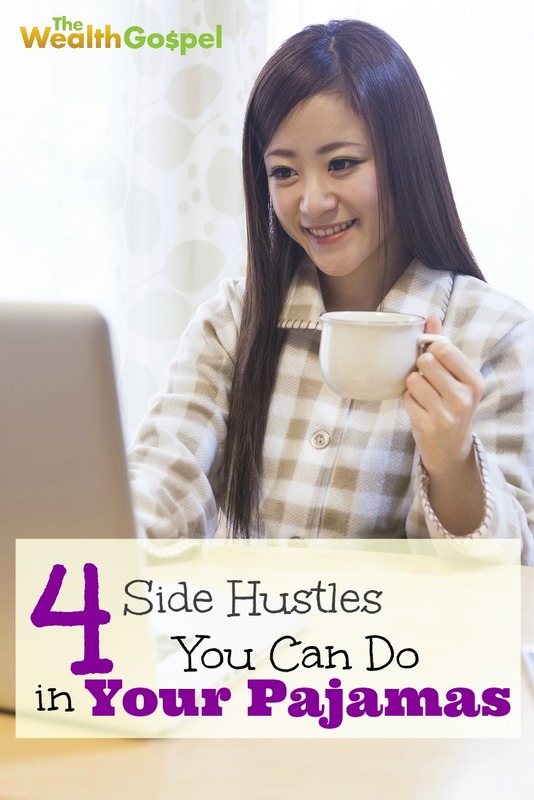 Here are 4 side hustles you can do in your pajamas and actually make money. The first thing on my list of side hustles you can do in your pajamas is freelancing. No matter if you are a freelance writer, freelance web designer, or you do some other kind of web-based freelancing, chances are that you can work in your pajamas from the comfort of your own home. Another great benefit of a web-based side hustle is that you can usually work at any time of day, whenever you have free time. One of my best friends in high school made extra money in the evenings and weekends by cleaning at people’s houses and a few local businesses. The work wasn’t terribly hard, and she was able to wear practically anything. If your pajamas mainly consist of yoga pants, you can probably wear your pajamas to this side hustle too. After all, you are there to clean not to look pristine. I enjoy crafting as a hobby, but not as a side hustle. However, I do know several people who’ve taken crafting to the next level and made a decent profit off of their crafting abilities. It seems like the best profits come from being willing to create custom products to match people’s style or preferences. Once you’ve met with a customer and taken a their order, you can definitely wear your pajamas while you make your craft projects. It’s even easier to wear your pajamas for this side hustle if you primarily sell your products online and don’t have to attend any craft fairs. You might want to wear real pants to go to a craft fair and peddle your products. Can you think of any other side hustles than can be done while wearing pajamas? Great list! My favorite sort of side hustles are ones that can be done from home. I did some “spreadsheet consulting” a few years back and it was a great side hustle that can be done from home. Really enjoyed it. I absolutely agree. Side hustles from home are the way to go! I actually have to get up and get dressed myself. I can work from home, but I have to be dressed to get in the right mindset.